Brand was born in Longmont, Colorado, May 9, 1931, and is the son of Rudolph William and Donna Mae Brand. He was active in Troop 64 of the Boy Scouts of America in Longmont, where he achieved its second highest rank, Life Scout. Brand graduated at Longmont High School in 1949, and at the University of Colorado at Boulder he received a B.S. in business in 1953 and a B.S. in aeronautical engineering in 1960. He was a member of the Sigma Nu fraternity and of the International Order of DeMolay. In 1964 he completed an M.S. in business administration at UCLA. Brand is married to the former Beverly Ann Whitnel, and has two daughters and four sons: Susan Nancy (born April 30, 1954), Stephanie Brand Lowery (born August 6, 1955), Patrick Richard (born March 22, 1958), Kevin Stephen (born December 1, 1963), Erik Ryan (May 11, 1981), and Dane Vance (born October 1, 1985). Brand was a commissioned officer and naval aviator with the United States Marine Corps from 1953 to 1957. His military assignments included a 15-month tour in Japan as a jet fighter pilot. Following his release from active duty, Brand continued service in U.S. Marine Forces Reserve and Air National Guard jet fighter squadrons until 1966. Employed as a civilian by the Lockheed Corporation from 1960 to 1966, he worked initially as a flight test engineer on the United States Navy's P-3 Orion aircraft. In 1963, Brand graduated from the U.S. Naval Test Pilot School and was assigned to Palmdale, California as an experimental test pilot on Canadian and German F-104 programs. Prior to selection to the astronaut program, Brand worked at the West German F-104G Flight Test Center at Istres, France as an experimental test pilot and leader of a Lockheed flight test advisory group. One of the 19 pilot astronauts selected by NASA in April 1966, Brand initially was a crew member in the thermal vacuum chamber testing of the prototype command module (alongside astronauts Joe Engle and Dr. Joseph Kerwin) and support crewman on Apollos 8 and 13. 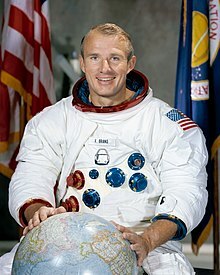 Later he was backup Command Module Pilot for Apollo 15, and was likely to be named to the prime crew of Apollo 18 before that mission was canceled. Brand was backup Commander for Skylabs 3 and 4. When Skylab 3's CSM had problems with its Reaction Control System, Brand was put on standby to command a rescue mission with backup Pilot Don Lind; however, the crew stood down when it was decided that the problem did not require the rescue mission to be launched. As an astronaut, he held management positions relating to spacecraft development, acquisition, flight safety and mission operations. Brand flew on four space missions; Apollo-Soyuz, STS-5, STS-41-B, and STS-35. He logged 746 hours in space and commanded three missions. Brand was the last member of his astronaut class to remain active with NASA, and was the only Apollo-era astronaut to pilot the Space Shuttle in the post-Challenger era. Brand was launched on his first space flight on July 15, 1975, as Apollo Command Module Pilot on the Apollo-Soyuz Test Project mission. 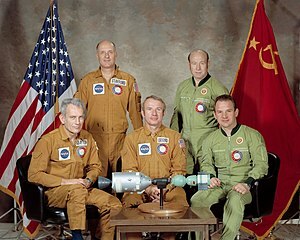 This flight resulted in the historic meeting in space between American astronauts and Soviet cosmonauts. Other crewmen on this nine-day Earth-orbital mission were Apollo Commander Thomas Stafford, Apollo Docking Module Pilot Deke Slayton, Soyuz Commander Alexei Leonov, and Soyuz Flight Engineer Valeri Kubasov. The Soyuz spacecraft was launched at Baikonur Cosmodrome, and the Apollo was launched 7½ hours later at the Kennedy Space Center. Two days later, the two spacecraft docked successfully. The linkup tested a new docking system and demonstrated international cooperation in space. There were 44 hours of docked joint activities which included four crew transfers between the Apollo and the Soyuz. Six records for docked and group flight were set on the mission and are recognized by the Fédération Aéronautique Internationale. Apollo splashed down in the Pacific Ocean near Hawaii, on July 25, and was recovered by USS New Orleans, completing a 217-hour mission. The mission almost ended in disaster when, during the final stages of the mission, the crew was exposed to near fatal amounts of nitrogen tetroxide gas. The reaction control system had been inadvertently left on during descent, and the poisonous fumes were sucked into the capsule as it drew in outside air. Brand briefly lost consciousness and all three crewmen required hospitalization in Hawaii for a number of weeks after landing. Brand was Commander of Space Shuttle Columbia for STS-5, the first fully operational flight of the Space Shuttle program, which launched on November 11, 1982. 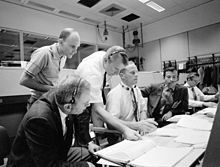 His crew comprised Colonel Robert Overmyer, pilot, and two mission specialists, Dr. Joseph P. Allen and Dr. William B. Lenoir. STS-5, the first mission with a four-man crew, demonstrated the Shuttle as operational by the successful first deployment of two commercial communications satellites from the Shuttle's payload bay. The mission marked the Shuttle's first use of an upper-stage rocket for payloads, the Payload Assist Module (PAM-D). The satellites were deployed for Satellite Business Systems Corporation of McLean, Virginia, and TELESAT of Ottawa, Canada. Two FAI records for mass to altitude were set on the mission. Numerous flight tests were performed to ascertain Shuttle performance. STS-5 was the last flight to carry the Development Flight Instrumentation package to support extensive flight testing. The STS-5 crew concluded the 5-day orbital flight of Columbia with the landing approach through a cloud deck to Runway 22 at Edwards Air Force Base, California on November 16, 1982. Mission duration was 122 hours. 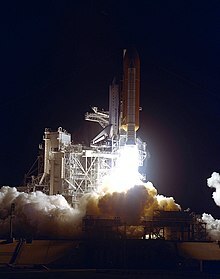 Brand commanded Challenger with a crew of five on the tenth flight of the Space Shuttle program, STS-41-B. The launch was on February 3, 1984. His crew included Commander Robert L. Gibson, pilot, and 3 Mission Specialists, Captain Bruce McCandless II, Dr. Ronald McNair, and Lt. Col. Robert L. Stewart. The flight accomplished the deployment of two Hughes HS-376 communications satellites which failed to reach desired geosynchronous orbits due to upper-stage rocket failures. 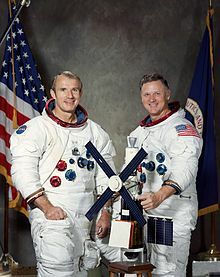 This mission marked the first flight checkout of the Manned Maneuvering Unit and the Manipulator Foot Restraint with McCandless and Stewart performing two untethered extravehicular activities. Shuttle rendezvous sensors and computer programs were flight-tested for the first time. The 8-day flight of Challenger ended with the first landing on the runway at the Kennedy Space Center on February 11, 1984. Brand was training initially for STS-51-H on Atlantis in November 1985. That mission was canceled and re-manifested as STS-61-K, a Spacelab mission which would've launched on Columbia in October 1986. That mission was canceled by the Challenger disaster. Brand again commanded Columbia on the 38th flight of the shuttle, this time with a crew of seven, on STS-35. The night launch on December 2, 1990 started a nine-day mission devoted to round-the-clock astronomical observations. Crewmen included the pilot, Col. Guy Gardner; three Mission Specialists, John M. Lounge, Dr. Robert A. Parker and Dr. Jeffrey A. Hoffman; and two payload specialists, Dr. Samuel T. Durrance and Dr. Ronald A. Parise. The 13-ton payload consisted of the three ASTRO-1 ultraviolet (UV) telescopes and the Broadband X-ray Telescope. More than 200 Orbiter maneuvers were required to point the telescopes. This Shuttle flight, one of the first dedicated to astronomy, provided a rich return of science data with emphasis on observations of very active celestial objects. A night landing was made on December 10, to Runway 22 at Edwards Air Force Base. Mission duration was 215 hours. Fédération Aéronautique Internationale (FAI) awarded Brand, along with Slayton and Kubasov, the Yuri Gagarin Gold Medal in 1976. ^ a b c d e f "Biographical Data: Vance DeVoe Brand". Lyndon B. Johnson Space Center. NASA. April 2008. Retrieved 2009-07-16. ^ Stanley, Rick (February 4, 1984). "Backed Up Cars; Broken Down Bus; a Beautiful Launch". Florida Today. Cocoa, Florida. p. 3A – via Newspapers.com. ^ "Columbia Makes Successful Night Launch". Statesman Journal. Salem, Oregon. Gannett News Service. December 2, 1990. p. 3 – via Newspapers.com. ^ a b c d e f "Vance DeVoe Brand". NASA. February 1, 2008. Retrieved April 17, 2019. ^ a b c d e Halvorson, Todd; Banke, Jim (March 15, 1992). "Veteran Astronaut Hangs up Spacesuit". Florida Today. Cocoa, Florida. p. 57. 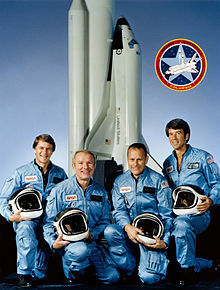 ^ "Flew on the Apollo-Soyuz Test Project and the first operational flight of the Space Shuttle". New Mexico Museum of Space History. Retrieved January 22, 2019. ^ "Alamogordo". El Paso Times. El Paso, Texas. September 10, 1996. p. 11. ^ "Vance Brand". Astronaut Scholarship Foundation. Retrieved January 22, 2019. ^ "Vince Brand on the DeMolay International Hall of Fame". DeMolay International. Wikimedia Commons has media related to Vance D. Brand.